I’ve had the amazing pleasure of meeting with over a dozen of the largest companies on the planet. These companies are some of the most innovative in the world and create many of the products you use on a daily basis both personally and professionally. Over the past few years, these companies have hired journalists, producers, broadcasters, and editors to refine and tell their stories on a consistent basis. It’s amazing to see firsthand the transformation of the marketing departments as we once knew them. But here’s my issue: Not one of those companies (not one) was working on an audience-building program focused on subscriber growth. 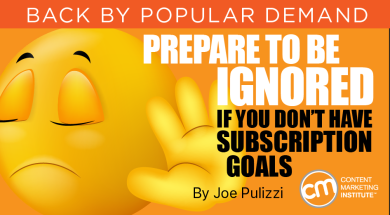 Sure, there were brand-awareness goals, perception goals, brand-lift goals, lead-generation goals, and lead-quality goals … but no subscriber goals. And the research confirms my personal findings. According to Content Marketing Institute/MarketingProfs research, less than one in three organizations have subscription growth as a content marketing goal. 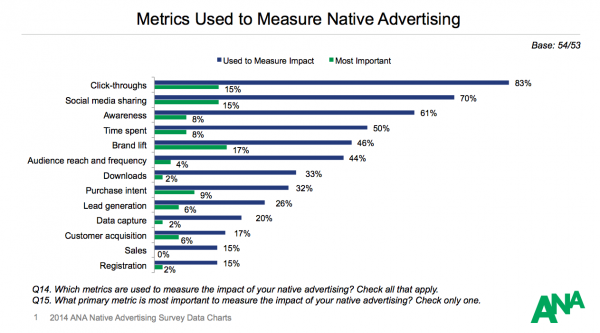 And Association of National Advertisers findings on native advertising didn’t even list subscription growth as a possible metric. Now, I’m not sure if this is a failing of the research, but the mindset is clear … building an audience is not even on the minds of most large enterprises today. Let’s take a step away from the dark side of the force for a moment. I want to share two examples of why I believe that subscription, or the idea of building groupings of valuable audiences, is the present and future for enterprises. The first example comes from traditional media. As you may know, I grew up in B2B publishing. The metric that dominated each publication on which I ever worked was the subscriber. Originally called circulation development, and now audience development, no revenue (the big Z-E-R-O) was possible without a targeted group of buyers who subscribed to one or many content offerings the media brand provided. Think about that … without subscribers, revenue was absent. That is media yesterday, today, and tomorrow. Look at the leading trade publication in your industry or ESPN, The Wall Street Journal, or The New York Times. None of them can function without subscribers. It’s important to note that at media companies like those listed, the asset isn’t content. The asset is the audience. We create content so that we can build the asset (the audience). I hear a lot of experts talking about “content assets” (which is fine and can be considered an asset if used properly), but the true asset is in the people with which we build loyal relationships over time and then can monetize in some way. The second example comes from a group of entrepreneurs. I would like to tell you that it was more complex, but it’s not. We found this formula repeating itself over and over again. Matthew Patrick, founder of Game Theory, delivers a 10-minute video per week to his audience of gamers. He now has almost 7 million subscribers. The growth of his company is astronomical. Ann Reardon went from stay-at-home mom to baking entrepreneur with How to Cook That. 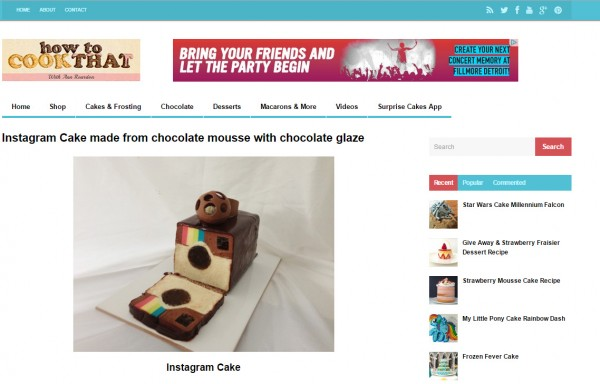 She differentiates herself by focusing on impossible food creations (like the Instagram Logo Cake … the old logo sadly), and now has approximately 3 million subscribers. My friend Brian Clark, founder of Copyblogger Media, went from “just a blog” to becoming one of the fastest-growing SaaS companies on the planet. The key to his success? Over 200,000 targeted subscribers who know, like, and trust Copyblogger so much that they end up buying just about anything Brian puts in front of them. While larger enterprises are fighting silo battles, politics, and tearing each other apart focusing on (sometimes) meaningless metrics, small players with patience and passion are building audiences and winning. Once you build an audience, anything is possible. You may think that if you have a lead-generation strategy you are building a subscriber base. While you are getting permission to reach out to someone, it is different than having someone opt in to receive ongoing communication from you — be it an email newsletter, a print magazine, or any of the other subscriber-based content vehicles. What might help is to first think about building an audience through subscription, then mine that subscription list for leads (as they engage in your pieces of content). I think you’ll find the leads you generate will be MUCH more valuable. These leads will be way more likely to buy from you if you nurture them over a longer time by delivering real value outside the products and services you offer. In just about every one of my presentations, I discuss the hierarchy of subscription. While I’m a firm believer in building our digital footprint as brands, we need to be wary of building our audiences on land we don’t own. Yes, we cannot own our audience, but there are different levels of control. 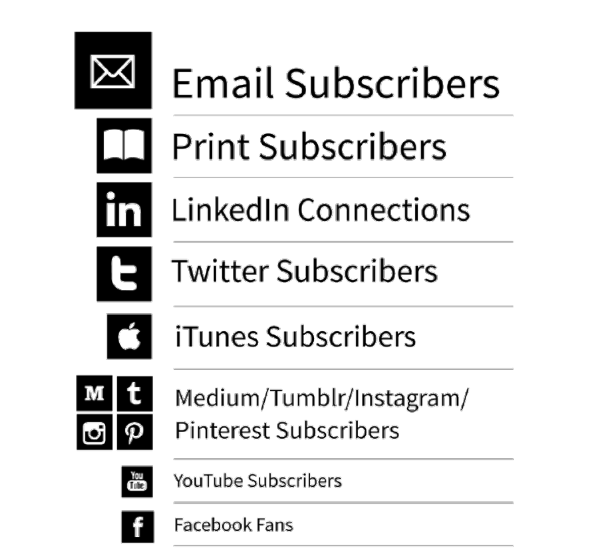 If you have your choice, email subscription is the most important type of relationship you can have with your subscriber, simply because you can control that connection the most. Your fans on Facebook or your followers on Twitter should be viewed as they are — temporary subscription opportunities with whom you can try to build relationships. Those connections are controlled by Facebook and Twitter, and the platforms can do whatever they want with them. We’ve obviously seen the changes Facebook has made, and the millions that brands have lost by focusing too much on these types of connections. Google doesn’t even know what they are doing with Google Plus. So tread lightly. Regardless of your industry or what you ultimately sell, you need an email offering to attract subscribers. 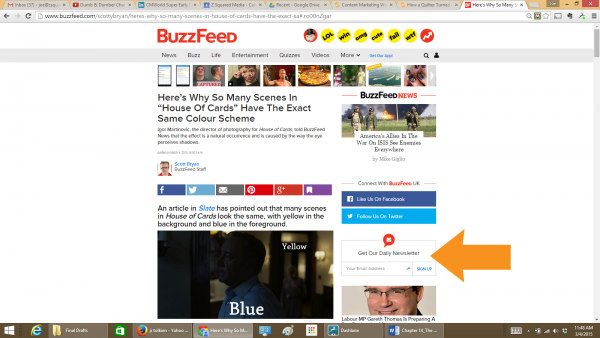 BuzzFeed, the media entertainment and news site, gained its popularity due to social sharing on Facebook and Twitter. While Facebook and Twitter subscribers are important to them, every page on BuzzFeed has a promotion to gain email subscribers to its daily e-newsletter. 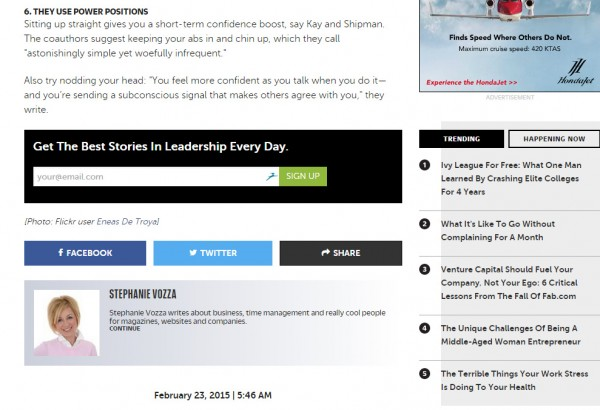 Business media outlet Fast Company includes this nice little email call to action at the bottom of every article. 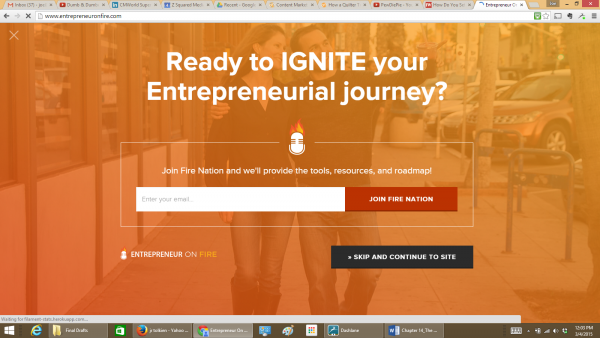 Let’s look at Entrepreneur on Fire from John Lee Dumas. His main subscription channel is iTunes. This makes sense since John’s key platform comprises audio podcasts. But, go to John’s website. The FIRST thing you see is a call to action for an email subscription. 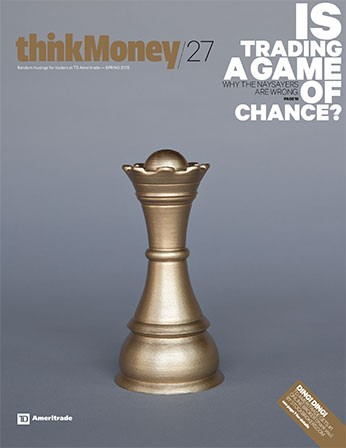 thinkMoney is a print and digital magazine produced by TD Ameritrade for active traders (who trade sometimes hundreds of times a day). In the early days, the program was under ongoing review about whether it was worth it for the company to continue spending money on the magazine. But the leaders persevered, and after approximately two years, they received the information they needed. TD Ameritrade found out that subscribers and readers of the magazine traded FIVE times more than non-subscribers. Today, thinkMoney doesn’t have to worry about ever being on the chopping block. Most enterprises don’t get to this point. They are too impatient and too campaign-focused with their content. But here’s what’s true in all the examples … if you build engaged audience members who devour your content, and thus, trust and like you, they will begin to change their behavior. They will stay longer as customers. Or they will buy more. Or they will close faster. Or they will bypass your sales team altogether and just buy from you. What is the difference between those who subscribe to your content versus those who do not? My goal for you is simple. Set audience-building and subscription as a key goal in your organization. Yes, you have many audiences, and to be successful at content marketing you’ll have to focus on just ONE audience for each audience-building initiative. You cannot target 18 personas with your blog. You’ll never be relevant or valuable enough for it to be successful. To go big, you need to ultimately go small.